Accelerated via converging influences, stand up paddle boarding has been on a sleigh ride of expansion, defying even the wildest expectations of contemporary evangelists. In peeling back the layers in consideration of the sports evolution, West considers the sport way beyond the short sound-bytes of information to be found on the internet. Here is a publication of epic proportions and purity of intent in bringing clarity to the madness, connecting with the reader in such a way as to make for compelling reading. If researching, writing and producing a book was easy, then as the expression goes, 'Everyone would be doing it.' The fact is, it's a long journey from conception to completion and where subject matter is dynamic, in a constant state of evolution, by the time information is written down, it's already under threat of extinction. In this context, this is how the production of this book has felt. In the meantime and by comparison, many questionable websites and video clips clog up the web daily and often resound authoritative. What is unique about the growth of stand up paddle boarding, is perhaps the way in which it has evolved and been served up so readily and so quickly in a manner which on many levels has permitted it to bi-pass the usual labour pains of birth and evolution itself. The internet has driven its popularity in a manner and on a scale rarely experienced by any other water sport on account of the age we live in and this is in stark contrast to say how surfing, windsurfing or outrigger canoeing experienced growth and evolution. While there have been a number of functionally novel innovations during the early stages of the sports contemporary evolution, it's fair to say that in truth many of the raw materials were already to hand. It did not take a paradigm shift in thinking to consider the idea of standing on a long board, albeit a sizeable Malibu styled surf board and use of a paddle for propulsion. By comparison, windsurfing required the development of a far greater number of components and had to factor in hydro-dynamics and aero-dynamics and in addition everything had to fit and match, where form and function were paramount, let alone the continued expansionism of the riders abilities and extremes in which they were performing. In a 1984 Windsurfer® brochure - Hoyle Schweitzer says, ' A futuristic vehicle for your dreams has risen out of the western sea, bringing new dimensions to life itself. How can such a simple, easy-rider device bring so much joy to millions? Because it puts you - with your skills and your dreams and your hidden potential - into a perfect interaction with wind and water. Thus, this one small vehicle brings with it the power to make your visit here on planet earth even more fulfilling.' Sure sounds what stand up paddle boarding could be, should be and should remain. Not driven home as a surf sport, but fully embraced as a sailing sport, it promised aspirations of friendships, communing with nature, health and fitness, the buzz of gliding over water and to some considerable extent it conveyed the feeling that we were part of a pioneering spirit – a new frontier in water sports. Contemporary definition of the sport suggests paddlers utilise a purpose made board of adequate volume and stability to support their weight while paddling using an extended canoe paddle to propel the board over water, employing a forward canoeing stroke, combined with directional steering strokes and varying weight placement to control direction. If a blood analysis were made of the sports leading paddle designs, typically the primal ooze extracted would confirm an OC positive blood type - a marginally modified and extended outrigger canoe paddle. It's this significant fact which defines this sport. The importance it is given, seems matter of fact, if at all. When famous names such as Duke Kahanamoku and other Waikiki Beach Boys began stand up paddling, they simply used outrigger canoe paddles of the time, long enough to be used stood up on a surfboard. Another famous Waikiki Beach Boy, Bobby Achoy and father John Achoy would use modified oars, from row boats. When Laird Hamilton and Dave Kalama improvised outrigger canoe paddles for their long boards in the mid 90s and Laird finally turned to Dave and said, 'I'm going to get a proper paddle made for this,' that became an epiphany in elevating what was essentially a novelty, to serious intent, in standing up on a board and paddling. Paradoxically, it took notable contemporary characters in the surfing / waterman community to acknowledge the potential. In one fell-swoop, the sport was made credible. In respect of stand up paddle surf boards, this is an area of the sport that was given the most immediate attention, extracting what is already known of surf board design and where parallels of design run close. The future evolution of the stand up paddle board, is truly wide open, more especially in the area of downwind ocean race boards, flat water race boards, adventure boards and river boards. Without putting too fine a point on this, stand up paddle surf boards are, after a basic recreational board, the least challenging of the scope of designs being considered, simply because what needs to be known, already is. Ultimately, no reasonable discussion regarding paddling technique can be complete without some understanding of its evolution and acknowledgment of key events and interventions. For the most part, some self-proclaimed experts often take a far too narrow view of the issue; micro-managing the various phases of the stroke, seeking perfection while often missing the big picture of what makes some paddlers fast. The action of paddling while standing ensures that we should spend some time considering the importance of the variance of stances we can adopt and address the issue as a matter of importance, as standing whilst delivering power to the blade is central to the sport. It's a confusing world where you have such variance of styles all based on a narrow principal of technique and then an even narrower principal of basic theory. As we move away from the theory, however scientific, the nuances and idiosyncratic difference between people soon manifest in wide and varied altered perspectives of how to paddle. Board handling includes issues such as steering using either weight placement alone, paddle placement (steering strokes) or a combination of both. Balance, while fundamental to the process of learning good board skills is not ultimately a defining quality to be confused with good board handling skills. Just because you have ‘good balance’ and rarely fall off, does not mean you have good board handling skills. It just means you have good balance. It’s your ability to control the board with blade and feet, to be its master. Stand up paddle boarding may not be a 'wind-sport' but it has a critical affect on the physical demands of the paddler. 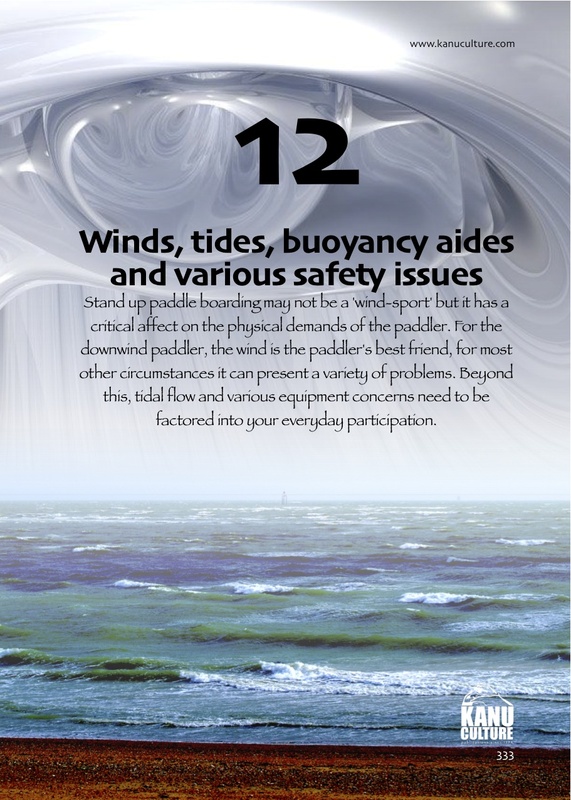 For the downwind paddler, the wind is the paddler's best friend, for most other circumstances it can present a variety of problems. Beyond this, tidal flow and various equipment concerns need to be factored into your everyday participation. This particular form of stand up paddling is gathering momentum rapidly. Of the three essential disciplines of the sport; surf, flat water cruising (limited breeze) and downwind paddling (strong winds) it is the latter which truly tests the riders combined surfing and paddling skills; dependant on endurance and an entire repertoire of ocean skills and physicality honed over many years of a devotion to an ocean sports lifestyle. Racing may not appeal to all, but it remains the cauldron and chalice from which designers and paddlers alike forge advancements of equipment through a need to go faster and ever further. As paddlers abilities out strip that of their equipment, this sets about a response to advance designs of both board and paddle. A right of passage within the waterman community means a great deal. It's born out of respect, out of doing your time and earning your place within the context of knowing your limitations, while advancing your abilities and knowledge, in a manner which respects others and safeguards you and those around you, while showing respect for the ocean's immense power and indifference to your well-being. Learning surf skills on a stand up paddle board represents one of the most hazardous rights of passage into the surf environment possible. In truth, the best way to learn to surf, is to free-surf first, learning the ropes at grass-roots level. Hone your paddling skills in the flat, then ultimately combine the two. This hasn't been happening and consequently surfers are rightly not happy about the lack of respect given. The worlds best stand up paddle surfers are so, not through divine intervention, but on account of having followed a natural path of progression. Stand up paddle boarding has widely been promoted as an excellent sport for increasing core-strength on account of the physiological and bio mechanical demands placed on the body in maintaining balance whilst paddling in a standing position. Before considering this widely promoted virtue of the sport, it may pay to wind things back a bit to consider how the popularisation of core- strength training originated to a point where it is often the catch cry of the sport in the absence of any other virtue. Using drills to practice and hone your skills can be very rewarding, but mostly it builds discipline. Stretching with the paddle brings gains in knowing what you're trying to do with it and improving your fine motor skills in managing it, while gaining the benefits associated with stretching. Various simulators are on the market, while other true and tested devices have already found solutions to bolting on accessories to simulate the stroke.